Manchester United’s already slim chances of securing a top four finish were dealt a heavy blow on Sunday, as they deservedly lost 1-0 to West Bromwich Albion. After a run of four wins in all competition that had somewhat eased the pressure on Louis Van Gaal, United delivered the sort of abysmal performance that has become a common theme of the Dutchman’s tenure. The feel good factor generated by the introduction of young players and by convincing wins against Midtjylland and Arsenal had been sorely tested against Watford but it completely evaporated at The Hawtorns, as United reverted to type. Slow in possession, shockingly poor without the ball and generally playing like a side desperately devoid of a plan, United, as they’ve done time and again under Louis Van Gaal, crumbled when the going got though. Van Gaal deserves credit for giving young players a chance but the last couple of weeks should not make a iota of difference as far as his future his concerned. He must go at the end of the season, as his second campaign in charge has been an unmitigated disaster, one which has been worsened by United’s penchant to take three steps back each time they’ve taken a step forward. With Arsenal and Spurs drawing, United kicked off against West Brom knowing that a win would put them two points behind Arsene Wenger’s side and bring them right back into the race for a Champions League spot. Instead, United crumbled without a fight as they have done time and again this season and now find themselves in sixth place, two points behind West Ham and potentially level with Liverpool if Jurgen Klopp’s side with their game in hand. A top four finish is now all but out of the equation and considering their meek surrender on Sunday afternoon, it’s hard to see this side progress past Liverpool and West Ham in the Europa League and FA Cup over the next 10 days. The curtain might, at last, be coming down on Van Gaal. Following United’s win against Watford on Wednesday, Louis Van Gaal spoke of how easy it had been for him to hand Juan Mata the captain’s armband, describing the Spaniard as one of the most mature players in the side. 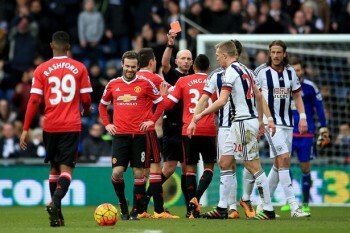 Unfortunately for Van Gaal, Mata’s behaviour on Sunday was anything but mature as he was sent off for picking up two largely avoidable yellow cards within three minutes in the first half. If the second was perhaps slightly harsh, as Mata did not make any contact with Darren Fletcher, the first was absolutely shocking in its stupidity, as it came after Mata tried to petulantly block a free-kick from being taken quickly. United have desperately lacked leaders so far this season and Mata’s sending off was a reminder of how short they’re in that department. With a trip to Liverpool in four days followed by an FA Cup quarter final on Saturday, Van Gaal’s decision to leave out Guillermo Varela, Morgan Schneiderlin and Memphis Depay spoke of a man whose eyes were firmly on the fixtures list. 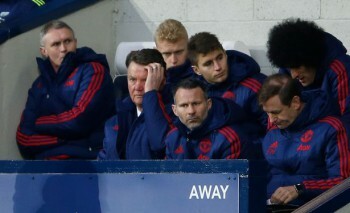 However, given the trio who was left out had been among United’s best players in their recent mini-revival, Van Gaal’s rotation policy was somewhat bewildering, particularly given Darmian’s lack of match fitness and the fact Carrick tends to get exposed in games that require dynamic midfielders. United will need to get through against Liverpool and West Ham for Van Gaal’s selection to be justified. Against Arsenal and Midtjylland, United looked dangerously suspect at the back but their attacking intent meant they had enough in the final third of the pitch to address their defensive issues. On Sunday, however, United were back to their usual awful selves, incapable of creating anything in the final third and displaying all the defensive solidity of a microwaved chocolate bar. Daley Blind, who Van Gaal inexplicably continues to pick at centre-back, even though the former Ajax man isn’t a defender by trade, was repeatedly exposed by Salomon Rondon’s physicality, while Matteo Darmian looked a shadow of the player who impressed earlier in the season. Van Gaal’s decision to withdraw Ander Herrera midway through the second half robbed United of any attacking threat, leaving West Brom free to repeatedly knock on the door. Once Rondon’s flung the door open, there was no coming back for United. The list of teams we have lost to this season is just embarassing. WBA, Sunderland, Stoke, Norwich, Bournemouth, Swansea. The youngsters were conspicuous by their absence. I think all along LVG intends to use them when senior players are injured. When senior players come back from injury they get relegated to the bench. And our inability to get results creates a huge barrier to LVG being able to field more than a couple of them at any given time especially as we will be forced to bring in some new players in the summer. Hear! Hear! pedestrian, plodding, ponderous, predictable. When United play like this, they are the easiest team to defend against in the Premiership. And can anyone explain why, when we were a goal down with 10 minutes to play, LVG sent on a defender? After Matas’ sending off there was an air of depressing inevitably. I was surprised that Hererra was subbed, it’s a measure of desperation when I wanted Fellaini on!!! !